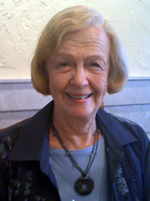 Mary Thompson was the national director of NCF from 1984-2007, then she served in a fund development role with InterVarsity until June 30, 2011. Now Mary is the Minister of Congregational Care in her home church in Minneapolis, MN. We talked with Mary as she reflected on her 43 years of working tirelessly to promote the Christian values that lie at the heart of nursing. NCF: You've had a number of different roles with NCF. As you look back, what are some of the highlights that give you a measure of satisfaction? Seeing students and nurses discover that nursing is ministry for Jesus Christ. For example, I was meeting with nursing students at the University of Wisconsin and we were discussing John 11:17-44. We observed the grief of Mary and Martha after their brother died and the ways Jesus cared for them. To apply this, we talked about how we can care for grieving patients and families. Then one of the students looked up with tears in her eyes and stated, "I never knew the Bible had anything to say about nursing!" I experienced joy in knowing that she was beginning her journey of following Jesus in nursing. Another fulfilling aspect of my NCF role was working with others to prepare conferences and Bible study guides to bring Christian beliefs to nursing practice. It was encouraging to hear examples of how these resources made a difference in their lives personally, and in their patient care. Encouraging nurses to develop and use gifts God has given them. As a leader in NCF, I sought to be a good steward of the people God brought to us. This included inviting them to be involved in ministry, and giving feedback about what I saw God doing in and through them. As people step out to be leaders, they need encouragement and to know that God loves them. It was a privilege to share the good news of God's love, that God calls each of us to be part of his mission in the world and that, as a community of believers with different gifts, we can influence nursing for Jesus Christ. Being part of God's global mission. Partnership with colleagues in NCF International was another highlight of my time with NCF. As an NCFI board member, it was a privilege to work with sisters and brothers in Christ to develop vision and plans that prepared nurses around the world to represent Jesus in nursing. NCFI conferences were a "taste of heaven" as people from many diverse backgrounds came together to worship God and be equipped for ministry in their countries. NCF: Who were the role models in your life? How did they inspire you? Mary: I was privileged to know Tressie Meyers and Grace Wallace, former NCF Directors. They influenced me as women who loved God and God’s Word. They loved people and encouraged them to be involved in ministry. Prayer was a vital dimension in their lives. Their example inspired me as I took on leadership responsibilities in NCF. Both women engaged in ministry in the church and community when they completed NCF work, and this also was an example to me. Next month, Mary will reflect on the changes she's seen in nursing and NCF over the years. She has great words of wisdom for nursing students entering the profession today, and she'll tell us more about what keeps her busy at this season of life. Don't miss "An Interview with Mary Thompson, part 2." Hi Mary! I enjoyed reading your interview, and am always interested in what you are up to! I thank you for the part you have played in my growth in the Lord, through your encouragement and prayers and teachings. Many blessings to you! Mary, you are always such a joy and inspiration to me. Thank you! I have fond memories of your time in as an Diego. I was a young nurse but now retired. Nursing hasn't left me, I still volunteer. I would like to reconnect with you.